・Click 「Rocket-Start」below, and make a trial run. (It has a limit in trial number). 1．Clik below 「Buy Now Button」,and pay $10-USD to 「PayPal」. *PayPal is a On-Line Paying Service that has more than ２．３-billion members. 2. And resister your home address and E-Mail, etc. 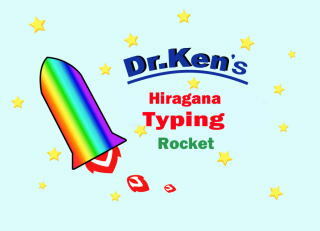 3． Down load address for "Hiragana-Typing-Rocket(Hiragana-Typing)" and [Serial Number] are send to you. 1.Unpack "Hiragana-Typing.exe" file by clicking. ２．Read "How to install" and "How to use" file that located at left-bottom. ３．First time, it is needed to connect Internet to run the program. ・Move launching base with use [ ← Key]　and　[ →　Key] , and eimit a rocket with [Space-Key] .